Below you’ll find various bits of Predators trivia. Quite a few different directors were rumoured to be directing Predators. At first, it was assumed Robert Rodriguez would be writer/director, however he was just producing it. Neil Marshall (Dog Soldiers, The Descent) was rumoured to be one of them. As were, Michael J. Bassett, Bill Duke and Marcus Nispel. It was announced in July 2009 that Nimród Antal had been chosen to direct Predators. The film is loosely based on a script Robert Rodriguez wrote 15 years ago called Predators and was set on a 17th century ship where a Predator stalks the crewman. Rodriguez said it was rejected because the budget would have been too big – about $150M. View this news article for more info. Recently, Rodriguez got a call from Alex Young over at Fox, who had found his original treatment. He wanted to re-invent the Predator franchise using his treatment as a guide. Alex Litvak and Michael Finch were hired to write the script. A recent draft of the Predators script was leaked online in November 2009. It’s dated July 12, 2009 and written by Mike Finch and Alex Litvak. It’s unknown if this was the shooting script but a lot of things are the same. Calling the movie Predators is a nod to James Cameron’s movie Aliens. Director Nimrod Antal wanted to cut the female role out because he didn’t want “a prop” running around and screaming. Rodriguez convinced him otherwise and Alice Braga was cast. The film-makers considered making Alice Braga’s character an alien but they scrapped the idea as it was “ridiculous”. Robert Rodriguez made it clear from the outset that this was a sequel to Predator and is in no way connected to the Alien vs Predator series. He also made it clear that any references in the movie should only be made to the original Predator film and no other movies. The title of the movie, Predators, has a double meaning. As well as meaning multiple Predators, it also refers to the characters since all of them are killers. It was decided that the film would be produced at Robert Rodriguez’s Troublemaker Studios instead of 20th Century Fox so that Rodriguez would have creative control over the project. Nimród Antal did over 100 pages of storyboards in preparation for directing. Predators had the same budget as AvP Requiem. Milo Ventimiglia, Freddy Rodríguez and Josh Brolin were considered for the role of Royce. Jeff Fahey was briefly considered for the role of Noland. According to Robert Rodriguez on the DVD commentary, Walton Goggins had been cast in the role of Stans, but Rodriguez felt the character was written far too much like the character Hudson in Aliens. So Rodriguez had the part re-written and asked director Nimród Antal to re-cast the role. But Antal insisted that Goggins could still do the role and scheduled a meeting between Goggins, Rodriguez and himself. Within a very short period of time, Rodriguez was convinced that Walton was still right for the part. Adrien Brody put on 25 pounds of muscle for his role. 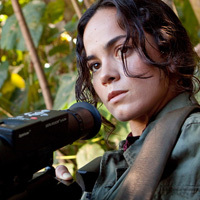 Alice Braga read a sniper manual in preparation for her role and carried a fourteen pound sniper rifle around with her during shooting. 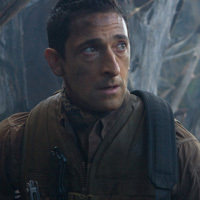 Adrien Brody was cast a week and a half before production officially began. The film was shot in 53 days. Louis Ozawa Changchien insisted his character Hanzo fight using Kendo as he is a practitioner of the martial art, instead of using Kung Fu as most Hollywood films do. Hanzo’s name is a reference to Hattori Hanzo, a legendary Japanese samurai of the Sengoku era (1467-1573 AD). Hattori Hanzo is also the name of Sonny Chiba’s character in Kill Bill: Vol. 1 (2003), which was written and directed by Robert Rodriguez’s good friend Quentin Tarantino. The average height of the actors who play the Predator creatures in this film are around 6’6-7″, while the actors in the previous films, Kevin Peter Hall Ian Whyte, were 7’2½” and 7’1″ tall, respectively. Nikolai was originally supposed to be armed with a Russian GShG-7.62 four-barreled rotary machinegun, as it would be more fitting for a Russian spetsnaz operator. The production crew was unable to obtain one, so they used an American M134 minigun instead. The unusual weapon used by Royce is an AA-12 fully automatic 12 gauge shotgun. Judging by the explosive effects produces by the shells, it is most likely loaded with Frag-12 explosive rounds. Isabelle uses a Blaser R93 Sniper Rifle fitted with an Elcan DigitalHunter scope. The official sniper rifle for active-duty Israeli Defense Forces personnel is actually the H-S Precision HTR, and it achieved that designation in May 2010, only a month before this movie was released. According to director Nimród Antal, the lower jaw attached to the mask of the Berzerker Predator is that of an alien from the Alien movie series. The actors did their own stunts in the cliff fall scene. While filming a fight scene, Oleg Taktarov hit his face on a Steadicam camera and started bleeding. He insisted that filming continued to add effect to the scene. Although all the main locations were filmed in Hawaii, 60% of the movie was shot in Texas in order to be eligible for a tax benefit. 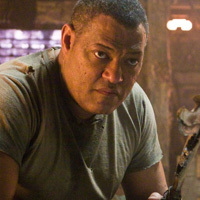 Laurence Fishburne filmed for just 2 days. Alan Silvestri, who composed the score for the original Predator, was asked to write this score to this film. He could not due to scheduling conflicts with The A-Team. John Debney, who Robert Rodriguez had worked with previously, received the assignment. Debney was quoted as saying that his score will be influenced by Silvestri’s original score for the 1987 film. The original plan was to alter the 20th Century Fox logo, turning it into heat vision (as seen from the predators viewpoint) halfway through the fanfare. The studio nixed that particular idea. The man whose parachute fails to open is wearing pixel-gray Army Combat Uniform fatigues, meaning he was most likely a soldier in the United States Army. The writing on the back of Stans’s prison jumpsuit identifies him as an inmate of California’s San Quentin State Prison. San Quentin has the largest Death Row in the United States. The alien creature that pursues Edwin through the jungle during the ambush scene is a slightly modified version of the original, abandoned Predator design from 1987. The song that plays over the credits is Little Richard’s “Long Tall Sally” and is a direct reference to the first Predator while the group of soldiers are travelling in a helicopter. Hanzo only speaks in one scene and has a total of 3 lines of dialogue. Royce, Isabelle, Nikolai and Noland are the only people to say their names in the film. Stans, Mombasa, Cuchillo, Edwin and Hanzo’s names are never revealed. The plant that Edwin identifies as “Archaefructus liaoningensis” has actually been extinct for several million years; its origin lies in the Cretaceous Period. Angiosperm fossils were found in China that are believed to be about 125 million years old, making it the world’s earliest known flowering plant. In an earlier draft of the script, Edwin highlights the plant’s origins, citing it as yet another inexplicable oddity before they finally realize where they are. 1) at one point, while facing near-certain death, one character tells another “If the time comes, I’ll do us both”, a reference to Hicks’ almost identical line in Aliens (1986). 2) when the group finds someone’s body, he has a large hole in his chest with the ribs bent outwards, referencing the way a Chestburster emerges from their host. 3) when the group enters the Predators camp there’s a brief view of an Alien skull on the ground. The first Predator doesn’t appear until 38 minutes into the film. Hanzo is missing two fingers on his left hand. The reason that the Yakuza traditionally cut their fingers starting from the left pinkie is that these fingers have a vital role in controlling a Japanese sword, and their loss would significantly impair a duelist. Hanzo must be a formidable swordsman to be able fight in close combat as he did despite the loss of his fingers. The original script contained cameo appearances by Dutch (Arnold Schwarzenegger) and Harrigan (Danny Glover), the lead characters from the previous Predator films.